Protect your iPad 9.7 2017 with this supremely functional gold and frosted white case with viewing stand feature. Also features smart sleep / wake functionality. I don't normally keep the packaging but this time I have . Looks and feels fragile. Unlike Samsung's 'cover' this actually enfolds the entire iPad ensuring its protection front and rear when not in use. The stand does exactly what it should. When I normally receive something in the post I throw away the packaging, but this case looks fragile so in case of a return I can reuse the packaging. It does look good and works fine but thankfully it has a 2 year guarantee. Fits perfectly and looks great, good value. My only reservation is the description of the colour as I was expecting a two tone cover. I like the colour but would call it Gold Frost. This case looks great - I like the soft gold however mine has broken on one corner. It hasn’t been dropped but bits of the plastic are chipping off slowly. Great for the price but not particularly strong. Gold colour very gold and maybe not entirely to my taste but case is well made and works perfectly. Fits well and should offer good protection. I have purchased the most fabulous IPhone cases from Mobile fun previously and love them, so thought I’d try them for an iPad case. My purchase was my fourth attempt to buy an iPad 2018 version case that doesn’t crack at the corners ( purchased the other three from popular on line companies) two weeks in and cracks have appeared at 3 corners. I don’t throw my iPad about, in fact it never leaves the house. I carry it gently from one room to another and mainly it sits on my lap. There must be something that manufacturers are missing and these corners must be ‘stress points’ . Bitterly disappointed and wonder if I will ever find a decent case for my new iPad as I’m giving up hope. I do not therefore recommend this case as this manufacturer has not got it right, just like the others. Exactly what I wanted, a perfect fit, well made and value for money. I previously owned an Apple branded iPad cover. This one is much cheaper and, in my opinion, better. 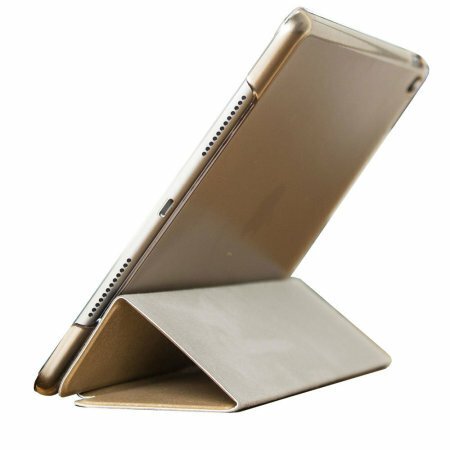 It protects both the front and back of the iPad with no loss of functionality. The clear back means the colour of your iPad is clearly visible and the gold metallic effect front cover looks really cool. Be aware that although recommended for iPad (2017 model) the case is very prone to breaking at the corners as I doesn't quite fit as it should. This has happened to both the original purchase and replacement. Exactly what I wanted - lightweight, fits my iPad 2017 perfectly and shows off the original finish. Gives good protection. The case fits nice and snugly onto the 2017 iPad, but is still quite easy to remove if it needs to be. Stands up well in landscape mode as designed. It’s nice that the colour of the iPad shows through the translucent rear cover. The front cover is soft, protecting the screen and switching the screen on/off when open/closed. Simple but very practical, great value for money. The only thing I miss is the ipad on-off switching by closing the case. Bought this for my wife's gold iPad, fits perfectly, colour is a very good match and it provides great protection for the iPad. As a bonus, this case is about £30 cheaper than the official Apple offering. I really thought that this iPad case was lost in the mail,but I got it today!!! Very happy with it.It fits perfect for 2017 model .Its one piece model ( cover &case ) and feels well made. Not as protective as I expected. I ordered this case for my new iPad, and I have to say it's a much better case than the much more expensive apple case. Service and dispatch were very quick as usual from mobile fun. I would definitely recommend this case for your iPad 2017. It's a good fit and not too bulky. Looks a lot more expensive than it actually is.